Eat. Live. Laugh. and sometimes shop! 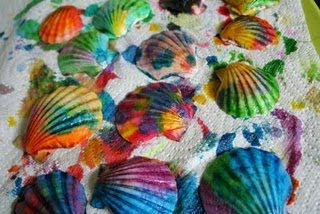 : Sally paints seashells by the seashore. Summer days can be long and hot. I am constantly imagining new ideas to keep my kids engaged, away from the TV, and out of the sun (for some portion of the day, that is). This idea did not originate with me, but we have been doing it for years after a weekend spent with friends in Rockport. It provides great motivation when collecting shells and then hours of "quiet" painting time. Ahhh. Today I read while they painted. Well, and then I painted just a few. We display the finished works of art in a clear jar on a shelf. We've been adding to the same jars for a few years and finally filled them entirely with this batch. I think we've improved our technique over the years. I'm loving the tie dye variety!